Violin bows generally weigh between 58 and 62 grams. A 58 gram bow is considered to be light, and a 62 gram bow is considered to be heavy. Many bows are available. I list only a few here. Full size violin bows by such makers as,Roger Zabinski, Lee Guthrie, Matthew Wehling, David Forbes, Manoel Francisco, Joseph Halligan, Steven Beckley, Douglas Raguse, Arcos Brasil, Alfred Knoll, J. P. Gabriel, Horst John, Marco Raposo, Erich Steiner, Alfred Knoll, John Brasil, Ronaldo Siqueira, D. Silveira, Andre Werlong, Heliomar Ciriilo, Alessandro Carlesso, Schaeffer, Fornacieri, Elias Guasti, Guy Jeandel, Juliano Oliveira, Luan Ruy, D. Carvalho, Charles Herbrig, Revelle, R. Nonato, J. G. Bottoni, Alfred Knoll, A. Fracallosi, Pl Grippa, William Harris Lee,J. Werner, P. Chagas, and many others. My inventory of older bows includes bows by many different makers including Charles Peccatte, Louis Morizot, Martin Beilke, H. R. Pfretzschner, Albert Nurnberger, and many more. A matching quartet of bows by Roger Zabinski. 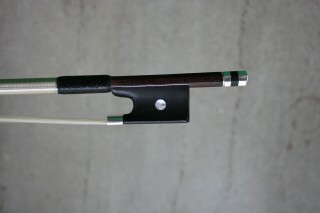 A violin bow by Robert Shallock, Paris. Violin bows, $10,000 or less. The bow is stamped "M.O.Beilke" on the shaft. The shaft is pernambuco wood of an orange brown color, carved octagonally. The frog is ebony with a gold ferrule and gold back plate. The eyes are shell with gold rings. the slide is shell. The adjuster is ebony with two rings of gold and a round shell inlay. The bow weighs 60 grams. The shaft is pernambuco wood of a reddish brown color carved round. The frog is ebony with a silver ferrule, shell eyes and slide, and a silver back plate. The adjuster is ebony with two silver rings and a round shell inlay. The bow weighs 60 grams. The adjuster is ebony with two silver rings and a round shell inlay. The bow weighs 59 grams. The bow is stamped "L Guthrie" on the shaft. The shaft is pernambuco of a reddish brown color carved round. The frog is ebony with a silver ferrule, shell eyes, a silver back plate and shell slide. The adjuster is ebony with two silver rings and a round shell inlay. The bow weighs 61 grams. The bow is stamped "H&S" on the shaft. The shaft is pernambuco wood of a reddish brown color carved round. The frog is ebony with a silver ferrule, shell eyes and slide. The back plate is silver. The adjuster is ebony with a silver cap. The bow is stamped "R Zabinski MPLS" on the shaft. The shaft is pernambuco of a reddish brown color carved round. The frog is ebony with a silver ferrule, shell eyes, a silver back plate and shell slide. The adjuster is ebony with two silver rings and a round shell inlay. The bow weighs 61 grams. The bow is stamped "R Zabinski MPLS" on the shaft. The shaft is pernambuco wood of a reddish brown color carved round. The frog is ebony with a silver ferrule, shell eyes, a shell slide, and silver back plate. The adjuster is ebony with two silver rings and a round shell inlay. The bow weighs 61 grams. The bow is stamped "L. Morizot" on the shaft. The shaft is Pernambuco of an orange brown color carved round. The frog is ebony with a nickel silver ferrule, shell eyes with nickel silver rings, and a rounded heel. The adjuster is ebony with a nickel silver cap with a round shell inlay. The bow weighs 58 grams. J. P. Gabriel, Horst John, Marco Raposo, Horst Schicker, Adolf Schuster, Elias Guasti, Cirilo, Buzatto, H.R. Pfretzschner, Albert Nurnberger, Otto Bausch. Manoel Francisco, Horst John, J.P. Gabriel, Marco Raposo, Cirilo, Guasti and Bottoni, Perreira, Many bows. The Coda "Prodigy" bow is under $300.00. This is a fine bow for the price. It is carbon fiber, has a good balance of weight, strength, and flexibility, and is a good durable bow. Call for availability. Many more bows are available in all price ranges. Please call for current availability.